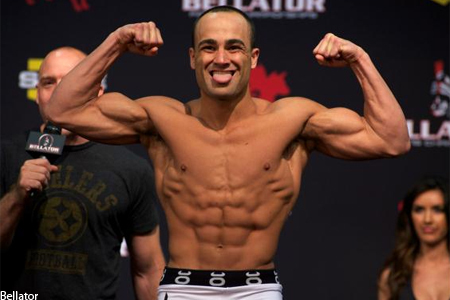 If you happened to miss Friday night’s shootout between Eddie Alvarez (Pictured) and Shinya Aoki at “Bellator 66,” despite the fact 5thRound.com offered a live stream of the entire event, no worries because we’ve located the replay to get you up to speed. It took Aoki all of 92 seconds to submit the former Bellator lightweight champ in their initial meeting in December of 2008, so it was only fitting Alvarez returned the favor by quickly disposing of the grappling ace by utilizing his specialty. After Aoki attempted an arrant standing elbow, Alvarez capitalized by countering with a vicious right hook that dropped the Japanese star. Alvarez instantly went in for the kill and it was a wrap shortly after that. Alvarez has one fight remaining on his Bellator contract. I-X Center in Cleveland, Ohio hosted last night’s festivities.